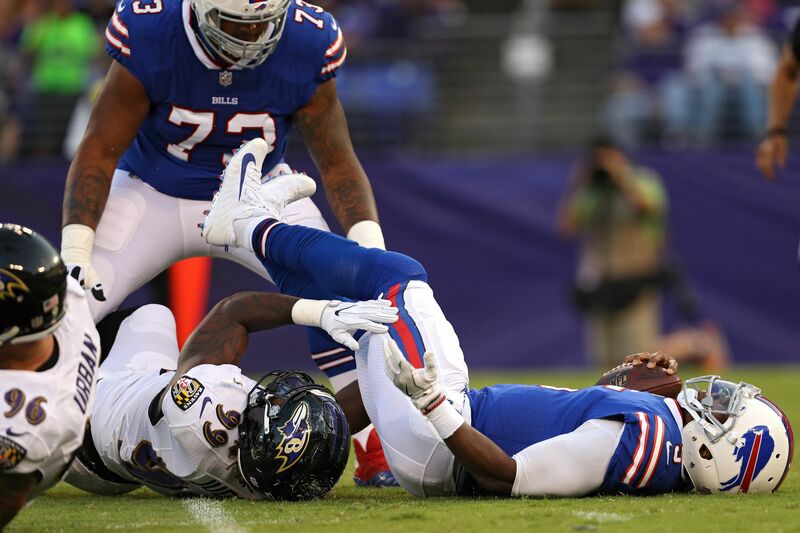 Early in Saturday’s preseason game against the Ravens, Bills quarterback Tyrod Taylor suffered a concusssion. Tyrod Taylor would have seen his most extensive action of the preseason Saturday night against the Baltimore Ravens. But it was not to be, as he left the game with a concussion in the first quarter after being sacked by Ravens’ linebacker Matthew Judon. With the Bills making a couple trades with an eye beyond this season, in particular trading wide receiver Sammy Watkins, speculation about Taylor’s status as starting quarterback surfaced. But head coach Sean McDermott said he “envisions” Taylor starting Week 1, and not rookie Nathan Peterman. Peterman was perhaps in line for some first-team practice reps after Buffalo’s’ second preseason game, and after Taylor left Saturday night’s game he got some action with the starters. If Taylor lingers in the concussion protocol, Peterman would get the start Week 1 against the New York Jets. Here’s the play Taylor was injured on. You can clearly see his head hit the turf pretty hard. However, Taylor did walk off the field and head to the locker room for further evaluation with no apparent assistance. The Bills have no long-term commitment to Taylor now, after an offseason contract restructuring, and he did not look good against the Ravens (1-for-3 for one yard) or overall this preseason (14-for-29 with two interceptions). Peterman may have been a threat to his job at some point this year anyway, and now this concussion stands to speed up that timetable. An already run-heavy offense, coming off 492 attempts last year (second-most in the league), may even ramp up in that fashion with Peterman under center. The major difference would be Taylor’s running attempts (199 over the last two seasons) being dispersed among running backs LeSean McCoy and Jonathan Williams with Mike Tolbert possibly in the mix too.